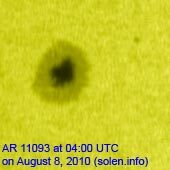 Last major update issued on August 8, 2010 at 06:30 UTC. 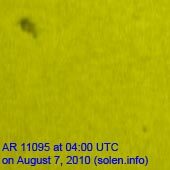 The geomagnetic field was quiet on August 7. Solar wind speed ranged between 355 and 413 km/s. 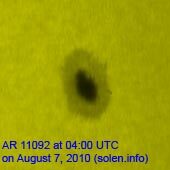 Solar flux measured at 23h UTC on 2.8 GHz was 81.8 (at 20h UTC the flux was 90.5, however, it was flare enhanced and the measurement at 23h is used instead). The planetary A index was 5 (STAR Ap - based on the mean of three hour interval ap indices: 4.8). Three hour interval K indices: 12111111 (planetary), 11221211 (Boulder). 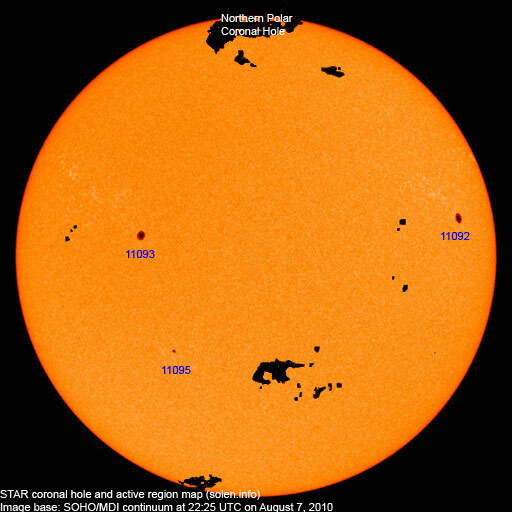 Region 11092 was quiet and stable. Region 11093 decayed slowly. 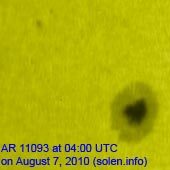 Flare: M1.0/2F at 18:24 UTC. 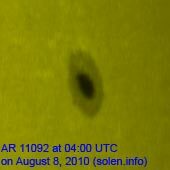 This flare was associated with a moderate type II radio sweep and a large and wide CME. Region 11095 changed slowly and remains simply structured. August 5-6: No obviously Earth directed CMEs were seen in LASCO or STEREO images. 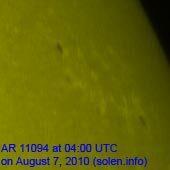 August 7: An impressive CME was observed in STEREO-B images after the M1 flare in region 11093. 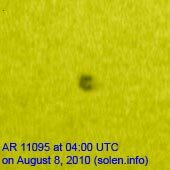 The CME is highly likely Earth directed. 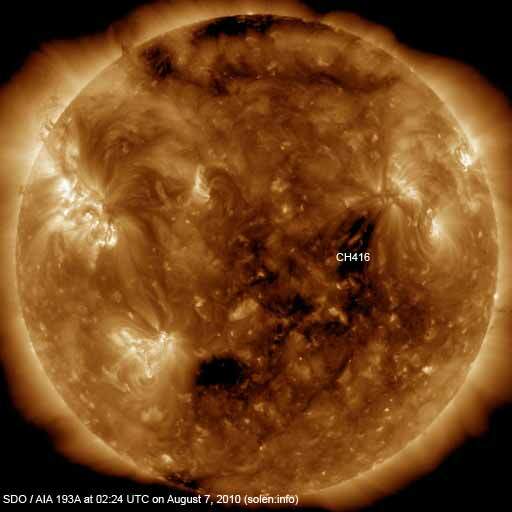 The geomagnetic field is expected to be quiet to unsettled on August 8-9 due to effects from CH416. 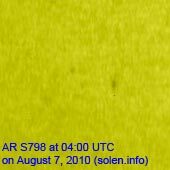 Sometime between 18h UTC on August 9 and 18h on August 10 the CME observed on August 7 will likely reach Earth and cause unsettled to major storm conditions.